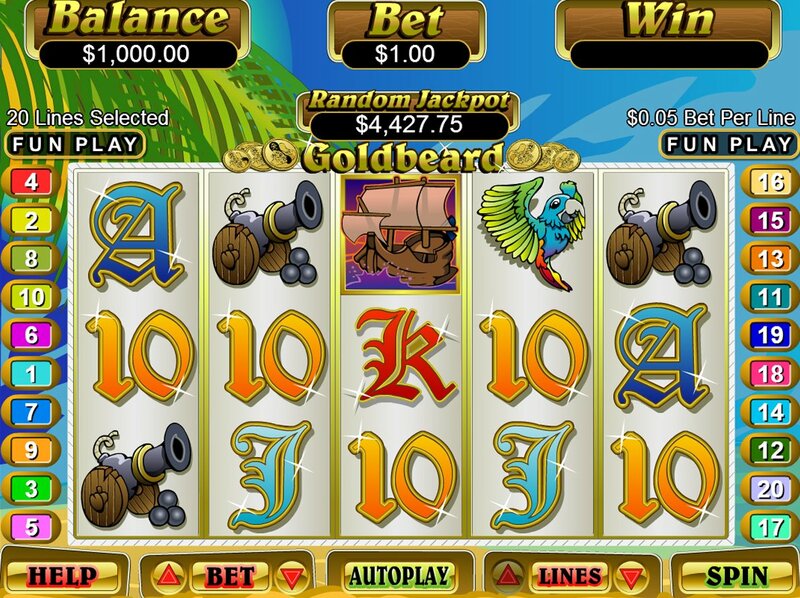 Pirate-themed slots always do well, it seems, and the quality on offer can range from the very good (NetEnt’s Ghost Pirates) to the average (Barcrest’s Captain Jackpot’s Cash Ahoy). 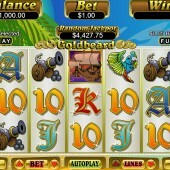 Renowned online slot developer Real Time Gaming’s offering – Goldbeard – falls roughly in the middle of those two, with a 5 reel, 20 pay-line slot that features simple graphics, basic gameplay, yet generous wins and a nice progressive jackpot. Among the classic 9-through-Ace symbols on the reels, we get plenty of treasure chests, cannons and parrots – so far, so shiver me timbers. But it’s the titular Goldbeard who you should look out for. The cartoony Goldbeard pirate of the title is the game’s Wild, and he’s really the key icon in this game. Not only does he substitute for all regular symbols in the game, doubling all wins that he helps form, but he also helps trigger the game’s bonus round. It’s worth mentioning that Goldbeard only appears on reels 1 and 5 in the base game, but when he does, every symbol appearing will flip over to reveal a free spin amount. Those amounts are totted up to give you your final free spins tally – anything up to 24. Although that may seem a bit stingy, remember that the Wilds are stacked on those two reels, so it possible to hit plenty of Goldbeards on the reels at the same time. During the free spins round, additional freebies can be won by hitting Goldbeard again on reels 1 and 5, plus our shipmate friend will appear on reel 3 to give you more chance of wins. There’s also – in keeping with RTG’s Real Series of slots – a nice little progressive jackpot up for grabs (you can follow it via the ticker on the main gamescreen) which is awarded randomly. Simple graphics, animation that won’t give 3D developer Sheriff Gaming any sleepless nights, and some generous bonus wins – if looks aren’t your thing there’s plenty to recommend the avid slots fan in this game. If you like this, try out some of RTG’s other progressive slots, like the panto-inspired Aladdin’s Wishes or the horseracing-themed slot, Derby Dollars.